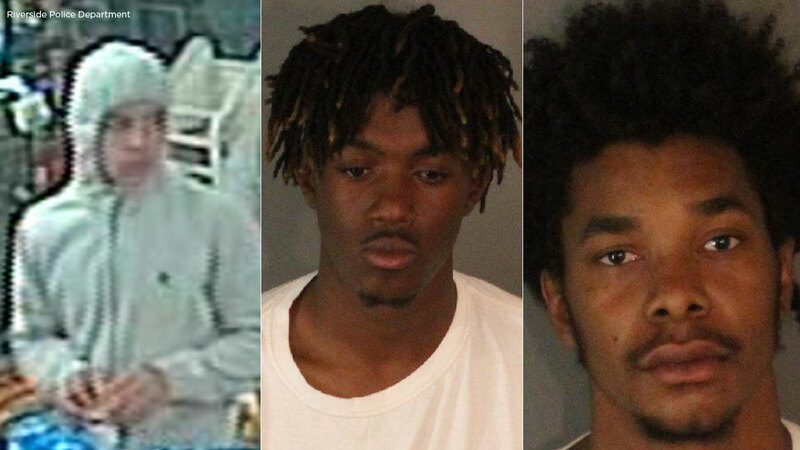 A sought suspect appears in surveillance video, alongside Nile Blackston-Jefferson and Gregory Michael Lee, arrested in connection to a robbery investigation in Riverside. RIVERSIDE, Calif. (KABC) -- Riverside police are searching for a suspect believed to be involved in a robbery investigation, which led to the arrests of five other people. Gregory Michael Lee, 20, of San Bernardino, and Nile Blackston-Jefferson, 20, of Riverside, were arrested for attempted carjacking, attempted robbery and conspiracy to commit a crime. In addition, two juveniles, ages 15 and 17, were arrested for robbery and attempted robbery. It all started on March 25, when Riverside police officers responded to a call of a robbery in the area of Palm Avenue and Sierra Street, located in the Magnolia Center neighborhood of Riverside. The adult victims reported they were confronted by a group of men asking for money. One victim fled and escaped after a suspect reached for the victim's pocket. The second victim was physically attacked and struck with a metal pipe before his property was forcibly taken from him. The suspects fled prior to the officers arriving. During an investigation, it was learned one of the adult suspects had committed a separate attempted carjacking and robbery where a gun was alleged to have been used. Detectives also discovered a third battery and theft investigation with a juvenile victim linked to the same group of suspects. On April 23, detectives served search warrants at two locations, along with a probation search at a third one related to this investigation. Lee, Blackston-Jefferson and two juveniles were located and detained. Homemade weapons described by the victims were located during the searches. The weapons were metal pipes wrapped with tape, police stated in a press release, and the vehicle used in the crimes was also located and seized. A fifth suspect was arrested and charged with illegal possession of ammunition, not related to the robbery investigation. Detectives released a surveillance photo of a suspect who they believe is involved in the robbery investigation. Anyone with information was urged to call (951) 353-7213 or bstennett@riversideca.gov. Those wishing to remain anonymous can email rpdtips@riversideca.gov.